AMC's Great Kids, Great Outdoors: Do kids really need nature? Critiquing the No Child Left Inside movement. Do kids really need nature? Critiquing the No Child Left Inside movement. The current issue of AMC Outdoors includes an article I wrote about the movement spawned by Richard Louv’s 2005 book, Last Child in the Woods. If you’ve heard of “nature deficit disorder,” a phrase from the book’s subtitle, or “No Child Left Inside,” a rallying cry that plays on the common name for the federal education funding act (No Child Left Behind), then you know something about the movement to reconnect children with nature. There’s a sentimental streak in Louv’s book, as he acknowledges. Louv grew up in 1950s suburban America and cherishes an historical moment that just happens to coincide with his own childhood, a time when children didn’t typically work on farms or in factories, and when childhood outdoors play was made possible by legions of stay-at-home mothers. As Nichols points out, childhood hasn’t always been suburban or idyllic. Like Nichols, I bristled at Louv’s blanket dismissal of parental fears about the dangers in letting children roam outside as freely as in previous generations. Vehicle traffic on residential streets has increased substantially over the last three decades, and the safety net provided by those mothers at home no longer exists. Louv doesn’t fully acknowledge the realistic concerns of today’s parents for their children’s safety. Nichols makes a persuasive case that Louv also doesn’t address the tension between his belief that children need outdoors childhoods and the enormous changes in family life and communities over the last half-century brought about by the wholesale entrance of women into the workforce. As Nichols notes, without a forthright discussion of the challenges facing working mothers, we aren’t really talking about the issues facing families and children. She also argues that Louv sets younger generations against older generations in his concern about media use among children. Returning to her own childhood, Nichols describes spending “many summer afternoons taping our own science-fiction radio show” with her brother and the creative influences of Star Trek reruns. In her view, it doesn’t matter whether kids learn to tinker by building forts or by playing around with HTML code; or whether they learn independence and use their imaginations in outdoor play or by creating videos. The basic lessons are what’s important. This criticism strikes me as a useful one for all environmental and outdoor organizations to consider. But even though Nichols cites a Kaiser Family Foundation report showing that kids “consume media an average of 7 hours and 38 minutes a day,” seven days a week, she seems strangely unconcerned about the sheer amount of time that children are spending with media. (See "How much TV is too much?") Beyond legitimate and well-documented concerns about obesity, attention deficit disorders, and other problems that have been attributed to too much screen time, the point ringingly made by Louv and others is that 50 hours a week in front of TVs, computers, and the like threatens to change more than childhood. Louv’s concern is that children who spend their childhoods predominantly in virtual or created worlds will not become adults who care about the natural world. We don’t know that they won’t, but we do know that the biggest predictor of whether an adult actively cares about the environment is whether that adult spent time playing and exploring outdoors as a child. Nichols’ sharpest and broadest critique sets Nature against Multiculturalism, conservatism and privilege against difference and diversity. Early in her article, Nichols writes, “As a feminist and white adoptive mom of an Asian son I’m disturbed by the belief that what’s ‘natural’ is always best for kids.” But her sensitivity as an adoptive mother possibly leads her to misread both Louv and the movement his book has helped create. When Louv uses the word “nature,” he’s not choosing sides in the nature-nurture debate: he simply means green, living things; ditches and sandlots; air and water and dirt. Fundamentally, it seems to me that Louv isn’t a conservative. He’s an idealist, a utopian. He wants today’s children — whether they’re Asian or white, adopted or not, city or suburban, rich or poor — to make real connections to the planet they live on. There should be room for individual parents to make choices that they think are best for their children, including taking them to cities instead of to trailheads, letting them explore virtual worlds more than natural ones, finding a balance that feels right for parent and child. That said, most parents would agree that we nurture what we love. Louv’s movement is for nurturing a love of the natural world. I’m with him. 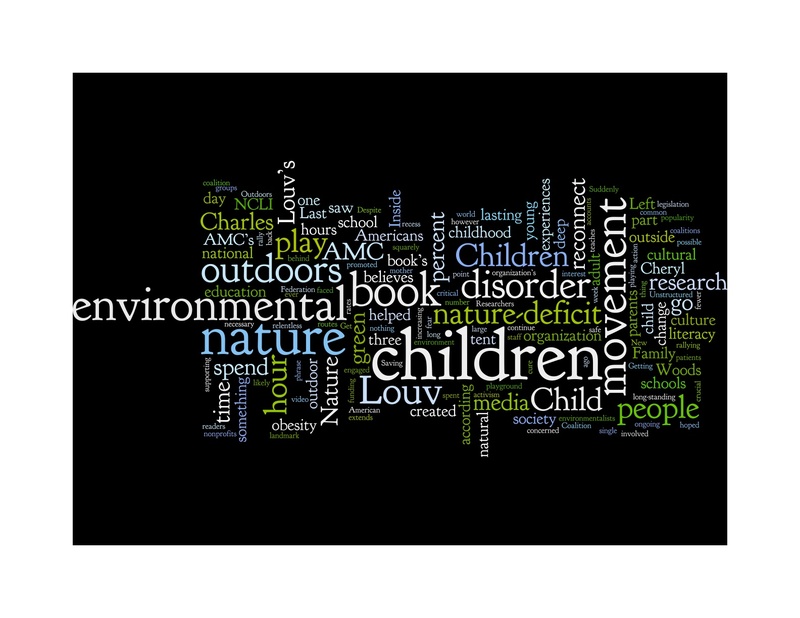 • Read the article on Richard Louv and the No Child Left Inside movement, and more, in AMC Outdoors (May/June 2010). • Read “Guilt Trip into the Woods” in Brain, Child (Spring 2010).